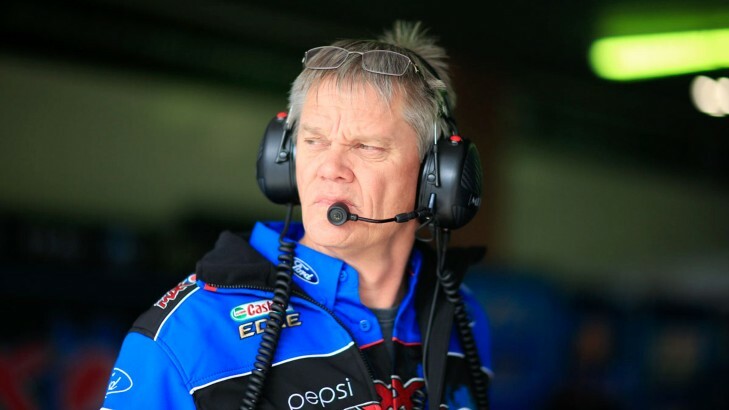 Esteemed engineer and key pit lane personality Campbell Little has extensive knowledge of V8 Supercars, having worked with a number of teams, drivers and co-drivers over the years. For Little, it's difficult to put a number on his Bathurst wins, as he has been part of many victories. "It's hard to say," he told v8supercars.com.au when asked how many wins he had to his name. "You're part of the team, you help make decisions - I don't think anyone can put their hand up and say it's my race car. The driver's driving it, the crew, everybody has to do the pit stop and everybody has to work on the strategy and it's a discussion about how it might all work the previous night." His knowledge of all the elements exactly why v8supercars.com.au spoke to Little - who is spending the Pirtek Enduro CupwithLucas Dumbrell Motorsport - about who has the goods, on the track and in the garage, for this weekend's Supercheap Auto Bathurst 1000. We saw them swarm the podium at the Wilson Security Sandown 500, and Little couldn't go against the big four Holdens - in fact, he was clearly impressed at the re-emergence of the Holden Racing Team. "The really obvious ones are the two Triple Eight cars," Little began. "But I think HRT are going to be very strong. They were reasonably strong there last year, but they're showing up each weekend and getting on top of the game. "Last year Bathurst was one of their strong points - and you can't write off (James) Courtney or Garth (Tander)." He felt that HRT's precision in the garage was as good as their recent on-track performance. "On that subject, they're normally very strong strategically, particularly Alistair (McVean, #22 car manager) ... and now, I think their stops and everything have picked up a lot this season. They're not tripping over as much as they have done the last couple of years and they're doing a good job down there and getting their act back together. "So those four Holdens would have to be the strongest, on paper." Little continued to list others he felt had good prospects. "It's hard - you're going to have half the field (listed), but you can't take it away from the Red Bull cars, or HRT - they'll be right there. Next in line for Little is defending champ Frosty. "For Ford - obviously Mark will be strong with Steve Owen. They had some dramas at Sandown but Mark has always been strong at Bathurst ... they had an issue at Sandown, but we haven't seen the mistakes they've made in previous years in the pit stops - I think they've gotten over most of that. We'll call Sandown a one off. "The next two probably are TEKNO and Brighty. "(Jason) Bright's always massively strong at Bathurst. In the past he has been able to pull that one out of the bag, as long as he's given the car back for that last third of the event. "Brad Jones Racing engineer Phil (Keed, on #14) is also very strong strategically, and he's been able to get the car up there from way back. Once you're on the lead lap, depending on when the safety cars happen late in the race, you can just pop up with the right sort of time throughout the day. "The other one is David Reynolds. The last couple of years both David and Dean (Canto) have been astonishingly fast at Bathurst. "And we saw Chaz (Mostert) before his shunt last year was very, very quick. It will be go to see him in a competitive car - last year I think after his shunt he lost his nerve and the car wouldn't have been very good, so we didn't see the best of him after that. "Throw in that Volvo - Scotty (McLaughlin) is doing a fantastic job. And his poor co-driver (Alex Premat) is going to have the weight of the world on his shoulders. I think Scott will get it up there and GRM have historically had reasonably good cars at Bathurst - not every time, but they've been up and down - but this year every time there's straights, or aero - and Bathurst has both - they're going to be right there. "Scott Pye and Ash Walsh ran very well at Sandown, and have been building to a good result all year. "And that's about 10 cars without batting an eyelid." Little agrees that LDM engineer Brendan Hogan, running the Russell Ingall/Tim Blanchard entry, is not afraid of running an alternate strategy with potential strong return. He thought the team's call on Scott Pye last year was extremely brave, seeing he and Paul Morris finish sixth. "A couple of those good combinations, they don't stretch their engine. They're not brave enough to run the fuel windows some of the others are. Last year we saw Scotty Pye get up there with some very brave decisions on fuel stops, but it paid off." He also felt Geoff Slater, running the Shane van Gisbergen/Jonathon Webb TEKNO Commodore, has some unusual ideas that often play out well. "When you race everyone and race them the same way, you end up with the same result ... When you're running in that lower 10 to 20, there's not that much you can do to get you up and fighting amongst everybody else. So you roll the dice and see what you can do. "And good on them for doing it and having bosses brave enough to let them do it. "You often toss around those ideas when you're in one of the top teams - you'd really like to do it, but you're sort of betting the bank because if it goes wrong you end up back there with some of those guys in the middle of the field and that's not fun, because the cars are so close, once you're back there to get back out of it, it's easier to make mistakes. "You only have to look at car 6 at Sandown - they had an issue with the pit stop. As far as lap time was concerned, it was the fastest car out there for 80 laps no one was faster than him, but when he was in the pack there was nothing much he could do. "Bathurst is going to be like that too - when you're racing each other, as we saw with Jamie last year, once you're behind, you're a brave man to get past." Will they go quicker than ever before? Mount Panorama has been resurfaced since the last Great Race, and times are expected to dial in much lower than Craig Lowndes' current lap record, a 2min06.8012, set in 2010. "The resurfacing - we saw the GT cars were four seconds a lap faster than they had been before, so it'll be a bit of a learning process for a whole lot of people," Little said. While he believes the surface won't make it quicker on the straights, across the top the Mountain there will be time to be gained. And with another year with the new generation V8 Supercars under their belts, Little believes teams and drivers won't find the cars as difficult to manage this time around. "I think it's a different race track, and a lot of people had years of experience of what to do, or what to expect from their cars when they got there. "I think everybody's starting to stabilise and use the same tricks." How will the cars hold up? While grip levels will be a challenge for the teams, Little believes most of the running gear on the new generation V8 Supercars has proven quite strong. "At Sandown we saw some pit stop issues, and damage issues which slowed cars, but nothing major mechanically." He believes the brakes have been good, and that most teams are now on top of the transaxles and front ends. "The brakes are a much bigger, better package than we had prior to the Car of the Future, so they're less of an issue. "We didn't see everybody do brake pad changes at Sandown but I think we'll see everybody do at least one change at Bathurst, particularly with the resurfacing. "If they've taken bumps and things out of The Chase - that could see the speeds into that corner going up quite a bit." "We saw at Sandown so many cars on the rev limiter for a massive amount of time - a lot were on the limiter last year so I think we're only going to go faster. I thinkthe time on the rev limiter, due to resurfacing, may effect the engine life of some and we will see a more people playing with aero." He noted the steering rack as one of the potential key issues. "Steering rack, as I said, is still a question mark for a lot of people - everybody's been working on ways to get around those issues, but the extra grip level may possibly see some issues in that department. "I daresay most will be going to Bathurst with extremely low kilometres or fresh components through they're transaxles, because that's historically what you did. But for a 500km race they would've run the same one all weekend and probably carry over most of those bits. Everybody is still working through the actual life of the components." "It wasn't that long ago that you could guarantee if something didn't break or go wrong, you'd be in the top 10 - that if you could just make it reliable, we can be top 10. "Now that's not good enough. Now you need a car that can sprint the last 300-400km as fast as it can go. "As the day goes on, the track grips up a lot and the lap-times come down. We're often seeing the fastest lap time on lap 120, 130, and even later. "Later the times are mitigated by vision - they're looking into the sun, or there's more shrapnel on the racetrack. "Unless it comes down to a dogfight in the last 10 or so laps, typically it's that 100-130 we see the fastest lap-times, when we've got good conditions and the rest going on. That's the time of day you've got to be fast. "We all just look at it as a sprint race - the only time the guys are looking after the cars is controlling the co-driver and making sure he doesn't do anything wrong and brings it back so it can go into the fight with a reasonable car." The Supercheap Auto Bathurst 1000 begins tomorrow at Mount Panorama. Who's your prediction and why?